Built the Memorial up from a 50 player event to one of the top rated NT events hosting up to 400 players each year. That would be a toss up between being inducted into the Hall of Fame, and the final moments of Memorial each year when everyone is happy and it's almost time to rest. Lots of players need to get a grip. A good one, that is. Eighty percent of recreational players will have their thumb right on the edge of there disc. We call this a loose grip, and it often creates disc flutter and a loss of distance. Try a grip with your thumb at least an inch off the edge. I think you'll like the results. Remedy for tray/cage putting: When following through from lower stance to the release point of the putt, focus on keeping your chin up. This technique will increase your success in clearing the tray. Power isn't everything. There's a lot to be said for finesse. A smooth throw will get you the results with a lot less effort than a power throw. Focus on rotating the upper body while following through with the hips. 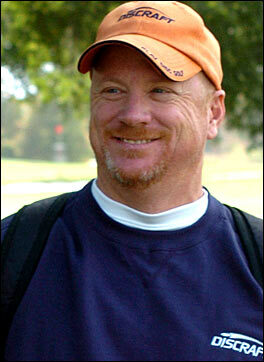 Team Discraft Co-Captain Dan Ginnelly of Arizona is one of the most influential players and promoters of the game. He served as Tournament Director for both the 2003 Pro Worlds and 2005 Am Worlds, and runs one of the sports biggest and most popular annual NT events: The Memorial. 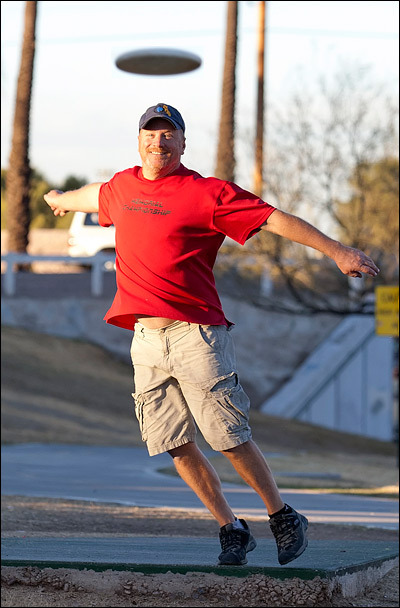 Dan is also an accomplished course designer, and owns Spinners On The Green, a disc golf and sports store in Scottsdale. He was inducted into the Disc Golf Hall of Fame in 2008. (174 gm) When the Surge first came out I aced a hole just over 400 feet. Only the second time that had happened on a hole that long in my 20+ years career. I aced again on January 12th, 2010 on long pin, hole #16 at Ft. Hills during a doubles round with young bucks, Paul Ulibarri and Nikko Locastro. I love this disc! (169 gm) As I get older, it's getting tougher put the heat on something like the Flash. NUKE has proven to be a good replacement. The lighter weight makes it more controllable and boy, does it go far! (172 gm) The XL comes out when I need a disc to throw straight through a tight fairway. Same deal in a wooded area. (172 gm) Trying to replace the XL with this one. Don't have to try as hard to get Stalker to go where the XL used to go for me. (172 gm) Used for roller shots or long straight narrow shots when I need it to flip up. (172 gm) I use the Buzzz for short turnover shots. It has great control. (173 gm) Put a fresh one in your bag and it's just like putting a seasoned Buzzz in there. Awesome. (172 gm) The Rattler is old school, and I love it. Floats like no other so I can run at long putts and not go too far by if I miss. (172 gm) I love throwing it 300 feet and under on upshots or drives, as long as there is a high ceiling. The Challenger is a very slow flyer so I have to throw it with lots of height if I'm going for distance. Plus it is a great windy day putter.